Paterson, NJ: Ingenuity's Ruins Rising Up ~ The History Girl! Paterson is a unique city in the New Jersey landscape. Once a hub of American ingenuity and industrial production, it slowly relinquished that role as mechanization and cramped space led industries out of the cities and into other parts of the United States. In the center of the city is one of the most unique natural wonders on the East Coast. The Paterson Great Falls, over 77 feet tall, is the second largest waterfall by volume east of the Mississippi River and played a major role in this country's early economic development. Its potential was seen by Alexander Hamilton and capitalized upon throughout the nineteenth and early twentieth centuries. After many years of neglect, the site has new potential, as it has been named the 397th National Park in the United States - and the first urban National Park in the nation. After the end of the Revolutionary War, much was to be decided about the newly independent United States of America. Alexander Hamilton in particular was concerned about developing a manufacturing sector, which was at odds with Thomas Jefferson's agrarian ideals. Hamilton felt it was important that Americans produce their own goods, supply jobs to the growing workforce, and rely significantly less upon European nations for finished products. In 1791, the Society of Useful Manufactures (S.U.M.) was formed between Hamilton and possibly a man named Tench Coxe. The newly-formed Society called for the establishment of an entire town supported by private investments and devoted to the Society’s manufactures producing a multitude of different products from linens to paper to beer. While no specific site was mentioned, Hamilton viewed New Jersey as the logical place for the venture due to its proximity to financial interests in New York and Philadelphia, an available labor force and abundant water power. Hamilton was no stranger to New Jersey as he served with Washington, visiting Monmouth, Morristown, Trenton and many locations in between. In August 1791, the S.U.M. met for the first time in New Brunswick and a board of directors was chosen. The name of the new manufacturing town, decided upon before the site was selected, was to be “Paterson” after William Paterson, New Jersey’s governor. With Governor Paterson’s support, the Assembly and Council of New Jersey quickly awarded the S.U.M a liberal charter. The charter gave enormous power to the S.U.M., including exemption from local taxes and the right to improve rivers, build canals and charge tolls. After a team of prospectors were sent out to find a suitable location for the planned city, one site in particular stood out. The location was the land surrounding the Great Falls of the Passaic River. The location seemed well-suited for an industrial city due to the abundance of water-power, timber from nearby forests, mineral ore in the surrounding mountains and its proximity to New York and Philadelphia. In May 1792, the S.U.M. convened with Hamilton present to officially authorize the purchase of 700 acres of land adjacent to the falls for $8,233.53. The 700 acres were owned by Dutch families and were mostly pastoral, with an occasional mill along the river. 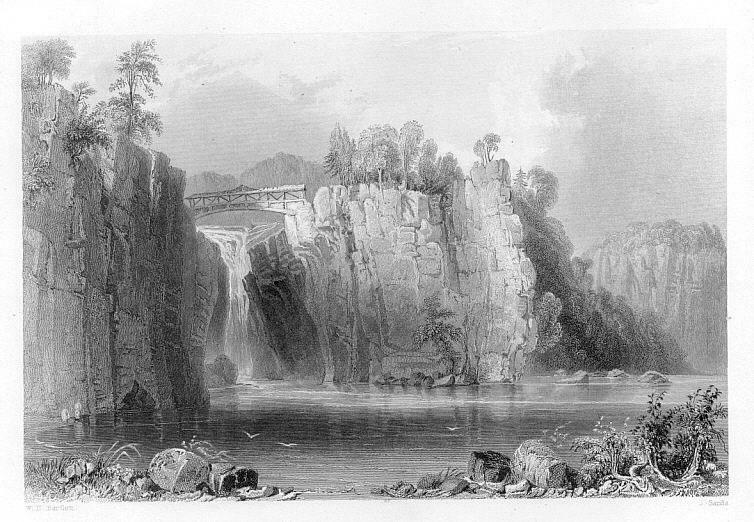 The Great Falls, circa 1850. The S.U.M. 's first priority was putting in place the infrastructure necessary to build an industrial city. Their original plans for canals proved to be too costly and the Society settled in the short term to build a cotton spinning mill, a weaving operation, an establishment for printing calicoes, a sawmill, and housing for workers. A financial panic between 1792 and 1793, caused by massive speculation of the S.U.M. 's governor, William Duer, left the S.U.M. with less cash on hand and a number of investors backed out. Hamilton rose to a leadership position and Paterson's manager until a replacement, Peter Colt, was hired. Colt was brought in to be the superintendent of the S.U.M. in 1793. Colt lacked engineering experience but proceeded, as best as he was able, to continue construction of the industrial buildings as finances would allow. The first, a small frame cotton mill was constructed, but powered by an ox and known as the “Bull Mill.” A canal was completed in January 1794, and water power became available later that year. 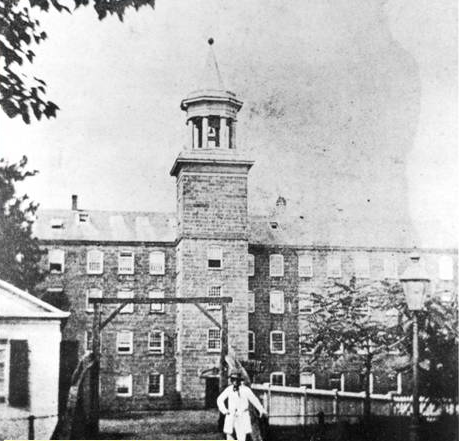 The second cotton mill, so long in the plans and constructed of stone and wood, opened in June 1794. Despite Colt's best efforts to improve the S.U.M. 's site, decline continued. In 1796, at an emergency meeting, the S.U.M. ceased operations and dismissed the majority of directors from their duty only five years after the signing of the charter. The S.U.M. was to enter a long period of land leasing and water power development only, as other entrepreneurs would enter the city to build vast enterprises. Over the next thirty years, the area around the falls remained rather stagnant, with a few manufacturers renting the mills. During this time, financial panics, the War of 1812, and even fire caused setbacks for Paterson's development. However, by the early 1830s, domestic manufacturing began to strengthen once again. Industries such as paper, rope, hemp, textiles, cotton, silk, locomotives and arms all sprung up in small mills along the river and raceways. In 1836, Samuel Colt established the Patent Arms Manufacturing Company in Paterson. Colt built a four story, brownstone structure with a bell tower. A weather vane in the shape of a gun sat atop the tower. Unsuccessful in gaining government contracts, the company was forced to close in 1842 after producing approximately 5,000 guns. The rise of immigrants as laborers after 1840 helped propel Paterson's industrial sector. By 1866, the Rogers Locomotive Works was established in the city. In the following years, Danforth and Cooke Locomotive Company and Grant Locomotive Company opened in Paterson and all three companies collectively built thousands of locomotives that were used all over the country. During the late 19th century, Paterson was established as a major center for locomotive manufacturing in the country. Despite the many different industries that settled in Paterson, the most notable is that of silk mills. During the late nineteenth and early twentieth centuries Paterson’s silk mills supplied close to 50% of the country’s entire silk production and ranked second behind Connecticut in the production of spool silk in the United States. Well over 100 factories and mills were involved in all aspects of silk manufacturing and necessary support in the late 1880s, employing thousands of skilled and unskilled workers, mostly recent immigrants, in jobs such as weavers, dyers, throwers, and twisters. The first attempt to produce silk in Paterson occurred in 1838 at Samuel Colt's gun factory. Christopher Colt attempted to weave silk on the fourth floor of the gun mill. It was quickly realized that it would be unprofitable and was abandoned. Christopher Colt sold his machinery to George Murray, who previously had owned a silk business. Murray brought in John Ryle, a knowledgeable person in the silk trade who came to America from the silk industry in England. Murray purchased the Colt factory in 1840 and Murray and Ryle became business partners, establishing a successful silk manufacturing company. Ryle eventually bought the property and expanded the business to additional mills. Other silk enterprises were established and prospered in Paterson well into the next century. Many were smaller operations that came and went using and reusing existing mills in the historic district for silk manufacturing and dyeing, or related work. Silk mills continued to prosper in Paterson during World War I. In time, many of the smaller companies were bought up by larger companies such as the Standard Silk Dying Company and Allied Textile Printers. As technological advancements occurred in the development of synthetic fabrics including nylon and rayon, Paterson’s role as “Silk City” came to a close. In 1945, the S.U.M.’s charter and remaining property were purchased by the City of Paterson, which now owns a great deal of the Great Falls Historic District. The S.U.M never lived up to its original intentions, but became prosperous from its real estate and water power rights. The last of the mammoth industries that built Paterson left by the early 1980s and many of the mills became vacant as industries no longer favored cities. A series of arson fires destroyed over thirty of the earliest mill structures in the Allied Textile Printing site, including the Colt Gun Mill. The Colt Gun Mill ruins, 2012. The Great Falls Historic District has been listed on the National Register of Historic Places since 1970. The district was designated as a National Historic Landmark by President Gerald Ford in 1976. The Great Falls' raceway and power systems were placed on the List of Historic Civil Engineering Landmarks in 1977 by the American Society of Civil Engineers. In 2001, a bill in Congress authorized the Secretary of the Interior to study the suitability and feasibility of designating the historic district as a unit of the National Park System. After a long and tedious process in order to gain the necessary approvals, appropriations, and financial commitments, the Great Falls of Paterson and its surrounding historic district became the site of this nation's 397th National Park on November 7, 2011. As development of the National Park site continues, the ruins of the Allied Textile Printers and Colt Gun Mill await a plan for interpretation, restoration, and reuse. The City of Paterson tells a story of a planned city built on industry to supply a nation with a variety of finished goods and products and the ingenuity that propelled the United States to become an industrial superpower well into the twentieth century. From these ruins a new National Park will rise, inspiring generations of visitors to explore and experience the natural beauty of the falls and see the raw potential that Alexander Hamilton saw over 220 years ago.